As a middle year program, I would like to introduce the inquiry based learning, which I consider as an innovative technology of teaching. Inquiry based learning is one of the main approaches in teaching of middle years program International Baccalaureate. Inquiry based learning based on cycle of reflection, action and inquiry. Inquiry based learning could start at any point of cycle. One of the main indicators of inquiry based learning is that students ask question about the topic. It comes from the Constructivist theory of John Dues, where students construct their understanding and knowledge of the world by experiencing things and then reflecting on those experiences. This quote is the best description of inquiry based learning. The essence of inquiry based learning is creation of conditions for asking questions. This is student centered approach in teaching; teacher guides the inquiry as it is necessary in the process of teaching. However, students gain knowledge themselves through the asked questions. There are several types of inquiry based learning in classroom. They are open or full inquiry, guided inquiry, couple inquiry and structured inquiry. Students’ knowledge will not depend on teacher directed activities. It is more than just memorizing facts, it is about learning skills to synthesize the information and find answers. The teacher plays an important role in inquire based learning, teacher provides feedback; helps lead the students in the right direction in the inquiry, teacher takes supportive role in education. The given video will provide better understanding of inquiry based learning in classroom. I have changed my topic of thesis recently. Now I will be focusing my research on topic “Appraisal is a tool of improving teaching quality”. So I guess, you can understand my current position with literature review. I need to find relevant literature that will really support my hypothesis and research. To tell the truth, I am struggling with this part, I am reading a lot in order to find a better definition to the “teaching quality” in my thesis. For this moment I have already found about five appropriate articles. Another challenge that I face is lack of time. Taking into account the coming verification visit of IB MYP my position of middle years programme coordinator does not let me focus on thesis a lot. Firstly, you need to define the key words that will help you to find the appropriate research to your topic. I would consider it as a very important part of literature review. If you find words that don’t fit with the topic, while reading the material we will get lost. And it will even take away you from your thesis topic. Secondly, read the introduction of each article and see its relevance with the topic of thesis. Sometimes, the findings of the article and conclusion can give you better understanding about the article. Thirdly, make a table which will help you to sort information. This table will help you to see the relevance to cite necessary parts of article and you do not need to read the whole article again and again. This table could simply consist of two columns research area / source and description/main findings/arguments. Fourthly, I would suggest some useful links that will help you to find recent resources like EBSCO, www.ascd.org , google scholar. This is the approach that I am using for this moment and hope that it will help me to succeed. The meaning of the word “citation” is a quotation from or reference to a book, paper, or author, especially in scholarly work. (http://www.oxforddictionaries.com) Literally, citing means to rely on different resources and use ideas, images, theories, words etc. from those resources. The idea of citing is to avoid plagiarism and promote the research work. Citing a source is a strength of writing and it supports information, which is provided in the work. Moreover, it brings evidence to your work and shows that proper research has been done towards the written work. Citing has different formats like APA, ACS, MLA, MHRA etc. However, it has common elements like author, article title, resource title, volume, date of publication and pages. The common rules of citing and formatting gives to the whole community clear understanding of using somebody’s ideas, theories and images. For example, looking at the reference you can easily define the type of resource it could be either book or article. The difficulties of citing is to follow the particular style of formatting. If you search the words “online learning” in Google search, in 0,39 seconds you will get 1 060 000 000 results. Top ten results are different universities that offer online learning. They are Harvard Online learning, MIT and some trusted sites like Coursera that suggests free online courses from more 120 universities around the world. This could be considered as a good indicator of popularity of online learning in the world. As Martin and et al mentioned in his article about growth of online learning in the world. The world market shows that self-paced e-learning reached $35.6 billion in 2011 with the 7.6% of annual growth rate. The highest growth rate is in Asia with 17.3% after goes Eastern Europe, Africa and Latin America. To my mind, this kind of approach could lead to the intensification of employee. This could be considered as a drawback of either online learnig or bad time management skills. Educators have pointed several benefits of online learning. One of them is that it allows them to differentiate their teaching style. A lot of courses are developd by international experts, who worked out excellent training materials that helps to cope with obstacles of distance, absence of contacts with other learners and application innovative teaching approach that will increace students interest. Another benefit is promotion of lifelong learning. It gives chance to update your professional skills and gain new knowledge without leaving your workplace. Thus many learner will be able to study accoring to the university or work requirements from home. Reading these two articles I understand that online learning is more than just a slogan or trend, it is an approach of lifelong learning that benefits more. Martin, S., Diaz, G., Sancristobal, E., Gil, R., Castro, M., & Peire, J. (2011). 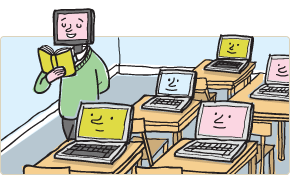 New technology trends in education: Seven years of forecasts and convergence. Computers & Education, 57(3), 1893-1906. What comes to your mind when you read the title To Sit Beside? The root of the word “Assessment” comes from Latin “assidere” which means “to sit beside”. (E.Harris, 2002) Literary, it means to sit beside the learner. As a teachers we have known the term “assessment” very well. Do we know anything about assessment of teachers’ achievement??? My thesis will be about evaluation of teachers’ achievement. I had a great chance to read article by Kim Marshal “It is time to rethink teacher supervision and evaluation” which actually inspired me and gave ideas to research. This article outlined the main issues of teachers’ supervision and evaluation. Principals observes lesson only if they get complaints from parents. And when teachers are asked about principal’s feedback they just say that the principal rarely talks to them. Principals evaluate only a tiny amount of teaching. If teacher teaches 900 lessons per year. A principal who evaluates one full lesson, in this case it is only 0.1% of the teacher’s instructions. And other 99.9 % of teacher’s work with students is unobserved. Even if principal observes three full lesson it is still 99.7%. It is not enough to make decisions about teacher’s level of teaching. Microevaluations of individual lessons aslo do not carry to much weight. Administrator give feedback to teacher according to the lesson that they have seen only. However, given feedback does not mean a lot to most teachers; they know that principal does not see their everyday struggles, curriculum planning, grading, work with colleagues, parent outreach and professional growth. Principals think that they show to teacher that they know everything about what they do. Evaluation almost never focuses on student learning and evaluation often give teachers judgemental feedback. My plan is to conduct case study at my school to research Principal and teachers perception of teachers supervision and evaluation. The first year of study was really challenging and it gave me clear picture of Kazakhstani education system. I saw it from different perspective, perspective of leader or implementer. The whole year was full of different task and readings which improved my time management, reading. thinking and writing skills. I guess, this year is somehow easy however it demands us to provide evidence of all gained knowledge.